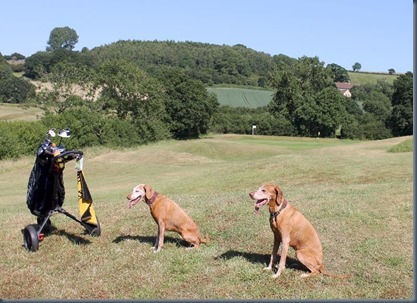 Welcome – We were greeted by a fellow player’s pooch in the pro shop which set the dog-friendly tone right away. Walk – The Players Club has full courses – Codrington and Stranahan – and a par 3 course. The former is the longer championship course, while the latter full course is the shorter course and more relaxed so we opted for that one (at 5457 yards). Wildlife – A few spaniel-sized hares were darting about (we encountered three during our round). The club’s policy is lead preferred or well under control. We normally have ours on leads at the outset of new courses any way until we (and they) get the lay of the land. 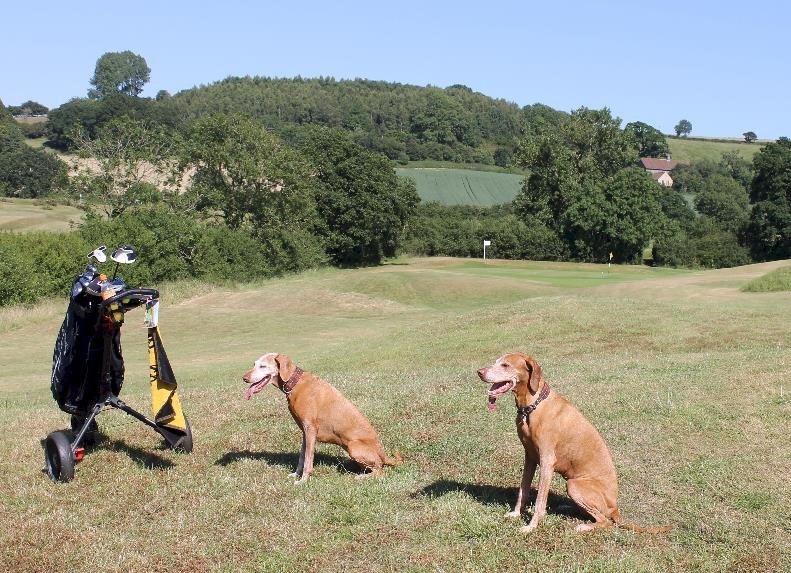 We eventually let Grace off to walk beside us (our dog golfing star), but unfortunately we had to put Rusty right back on as the hares proved just to intriguing for her to maintain her control. Water – On the first six holes, 3 have scenic water hazards next to them. 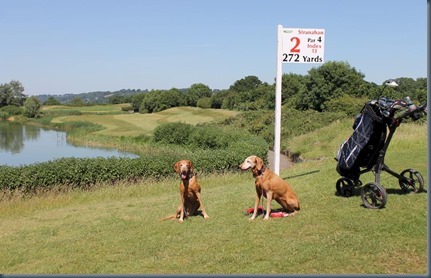 If you are a dog, then enjoy the water while you can, because once you finish with the sixth hole, you enter a parched savannah without many trees or much shade. 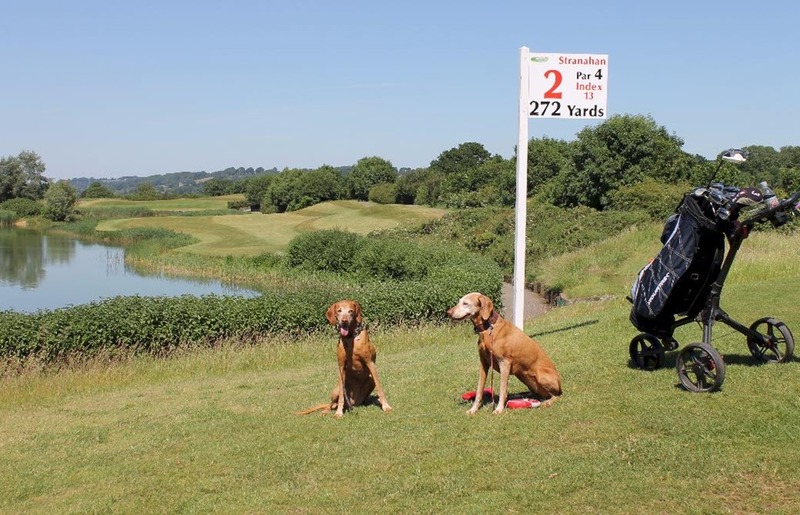 The course is also set quite far away from the clubhouse so you can’t easily pop off the course for a refreshment at the bar or clubhouse spigot. Wind Down – Our wind down started at the clubhouse after record temperatures during the day in the very open fairways parched all of us. The clubhouse is a spacious affair where dogs were also welcomed (at many dog friendly courses, dogs are not however allowed in the clubhouse). Grace and Rusty enjoyed a bowl of water while Lori and I downed a bitter shandy and a pear cider. It was extremely cosy as we settled into some very comfy armchairs to watch Iran’s “upset” tie with Portugal while the girlies collapsed on the carpet beside us. For a more nourishing wind down, we turned to the old stand-by, DoggiePubs.org.uk, and found the nearest 5-star option – The Bull in Cippenham, 1.8 miles away. A great recommendation as the girls were welcomed by patrons and hosts alike. 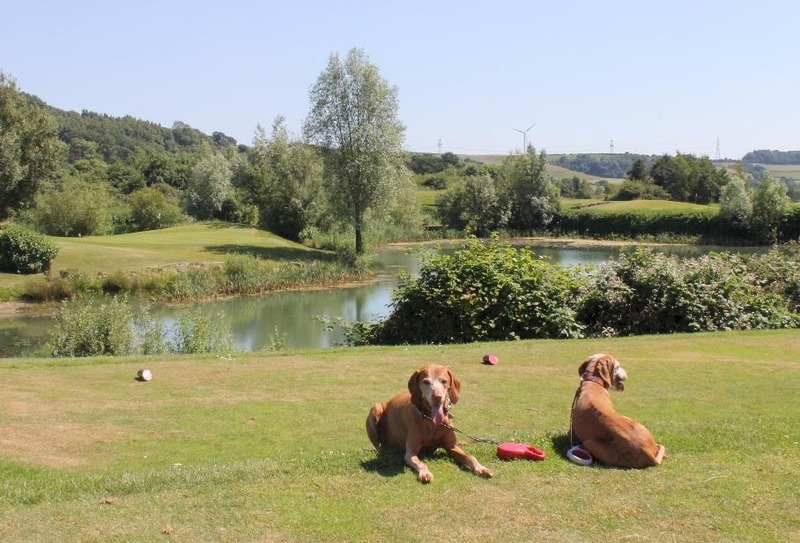 The pub is nestled in some wooded area with both a large outdoor patio and an extensive garden off to the side (the dogs are allowed inside as well). The food was delicious. We both had the gourmet burger that the server had recommended and were very impressed. Everyone thinks they can make a gourmet burger these days by simply piling a bunch of esoteric ingredients on top, but this one had a really good flavor. The girls appreciated the dog biscuits kept in a big jar at the bar, but enjoyed a few nibbles of my Pork Belly Bites even more, methinks.